At OSCON, I had the pleasure of doing a IBM Dojo Podcast with some deep experts in the container and data center space: Dan Berg (@DanCBerg) and Phil Estes (@estesp). We dove into a discussion around significant trends in the container space, how open technology relates to containers and looked toward the technology’s future. We also previewed next month’s DockerCon, which is set for June 19-21 in Seattle. 00:35 – What are the trends in Containers? 2:45 – Are the changes keeping people from moving forward? There are a lot of orchestration choices but there’s confusion between Docker and the container ecosystem. 7:00 We’re at OSCON, how far has the technology come in being open? Phil thinks that open container initiative (OCI) is helping bring a lot of players to the field. Dan likes that IBM is experimenting in community and drive interactions between projects. Rob is not sure that we need to get everyone on the same page: open source allows people to pursue their own path. Dan: if you’ve got any worthwhile product, you’ve got some open source component of it. There are various ways to profit around that. 13:00 What are we going to be talking about this time next year? Rob (joking) we’ll say containers are old and microkernels are great! Dan believes that we’ll start to consider containers as more secure than what we have today. <- Rob strongly agrees! 20:30 2016.Dockercon Docket- what are you expecting? Phil is speaking there on the contribute track & OCI. Rob is doing the hallway track and looking to talk about the “underlay” ops and the competitive space around Docker and Container. We often act as if coding, and especially open source coding, is a unique activity and that’s hubris. Most human activities follow common social patterns that should inform how we organize open source projects. For example, research papers are very social and community connected activities. Especially when published, written compositions are highly interconnected activities. Even the most basic writing builds off other people’s work with due credit and tries create something worth being used by later authors. Research before writing – take some time to understand the background and goals of the project otherwise you re-invent or draw bad conclusions. Give credit where due – your work has more credibility when you acknowledge and cross-reference the work you are building on. It also shows readers that you are not re-inventing. Follow the top authors – many topics have widely known authors who act as “super nodes” in the relationship graph. Recognizing these people will help guide your work, leads to better research and builds community. Find proof readers – All writers need someone with perspective to review their work before it’s finished. Since we all need reviewers, we all also need to do reviews. Rework to get clarity – Simplicity and clarity take extra effort but they pay huge dividends for your audience. Don’t surprise your reader – Readers expect patterns and are distracted when you don’t follow them. Socialize your ideas – the purpose of writing/code is to make ideas durable. If it’s worth writing then it’s worth sharing. Your artifact does not announce itself – you need to invest time in explaining it to people and making it accessible. Thanks to Sean Roberts (a Hidden Influences collaborator) for his contributions to this post. At OSCON, Sean Roberts said “companies should count open source as research [and development investment]” and I thought he’s said “…as research [papers].” The misunderstanding was quickly resolved and we were happy to discover that both interpretations were useful. Now that my PDX Trimet pass expired, it’s time to reflect on OSCON 2014. Unfortunately, I did not ride my unicorn home on a rainbow; this year’s event seemed to be about raising red flags. No superstar. Past OSCONs had at least one buzzy community super star. 2013 was Docker and 2011 was OpenStack. This was not just my hallway track perception, I asked around about this specifically. There was no buzz winner in 2014. People were down on OpenStack (“DownStack”). Yes, we did have a dedicated “Open Cloud Day” event but there was something missing. OpenSack did not sponsor and there were no major parties or releases (compared to previous years) and little OpenStack buzz. Many people I talked to were worried about the direction of the community, fragmentation of the project and operational readiness. I would be more concerned about “DownStack” except that no open infrastructure was a superstar either (e.g. : Mesos, Kubernetes and CoreOS). Perhaps, OSCON is simply not a good venue open infrastructure projects compared to GlueCon or Velocity? Considering the rapid raise of container-friendly OpenStack alternatives; I think the answer may be that the battle lines for open infrastructure are being redrawn. Free vs. Open. Perhaps my perspective is more nuanced now (many in open source communities don’t distinguish between Free and Open source) but there’s a real tension between Free (do what you want) and Open (shared but governed) source. Now that open source is a commercial darling, there is a lot of grumbling in the Free community about corporate influence and heavy handedness. I suspect this will get louder as companies try to find ways to maintain control of their projects. Corporate upstreaming becomes Imperative. There’s an accelerating upstreaming trend for companies that write lots of code to support their primary business (Google is a primary example) to ensure that code becomes used outside their company. They open their code and start efforts to ensure its adoption. This requires a dedicated post to really explain. There’s a clear theme here: Open source is going mainstream corporate. We’ve been building amazing software in the open that create real value for companies. Much of that value has been created organically by well-intentioned individuals; unfortunately, that model will not scale with the arrival for corporate interests. Open source is thriving not dying: these companies value the transparency, collaboration and innovation of open development. Instead, open source is transforming to fit within corporate investment and governance needs. It’s our job to help with that metamorphosis. Last week’s day-long Board Meeting (Jonathan’s summary) focused on three major topics: DefCore, Contribute Licenses (CLA/DCO) and the “Win the Enterprise” initiative. In some ways, these three topics are three views into OpenStack’s top issue: commercial vs. individual interests. But first, let’s talk about DefCore! DefCore took a major step with the passing of the advisory Havana Capabilities (the green items are required). That means that vendors in the community now have a Board approved minimum requirements. These are not enforced for Havana so that the community has time to review and evaluate. For all that progress, we only have half of the Havana core definition complete. Designated Sections, the other component of Core, will be defined by the DefCore committee for Board approval in September. Originally, we expected the TC to own this part of the process; however, they felt it was related to commercial interested (not technical) and asked for the Board to manage it. The coming meetings will resolve the “is Swift code required” question and that topic will require a dedicated post. In many ways, this question has been the challenge for core definition from the start. If you want to join the discussion, please subscribe to the DefCore list. The majority of the board meeting was spent discussion other weighty topics that are work a brief review. Win the Enterprise was born from product management frustration and a fragmented user base. My read on this topic is that we’re pushing on the donkey. I’m hearing serious rumbling about OpenStack operability, upgrade and scale. This group is doing a surprisingly good job of documenting these requirements so that we will have an official “we need this” statement. It’s not clear how we are going to turn that statement into either carrots or sticks for the donkey. Overall, there was a very strong existential theme for OpenStack at this meeting: are we a companies collaborating or individuals contributing? 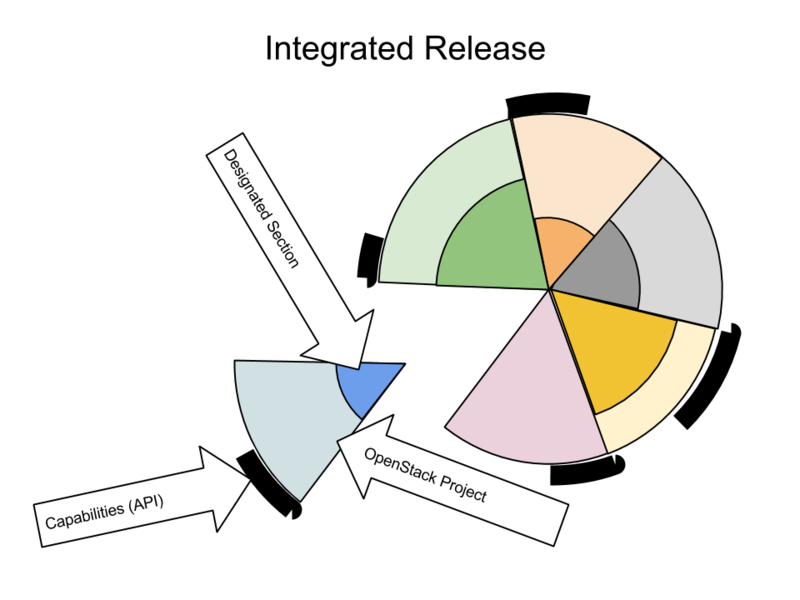 Clearly, OpenStack is both but the proportions remain unclear. Answering this question is ultimately at the heart of all three primary topics. I expect DefCore will be on the front line of this discussion over the next few weeks (meeting 1, 2, and 3). Now is the time to get involved if you want to play along. The OpenStack Board effort to define “what is core” for commercial use (aka DefCore). I have blogged extensively about this topic and rely on you to review that material because this post focuses on updates from recent activity. First, Please Join Our Community DefCore Reviews on 7/16! We’re reviewing the current DefCore process & timeline then talking about the Advisory Havana Capabilities Matrix (decoder). Note: I’m presenting about DefCore at OSCON on 7/21 at 11:30! We want community input! The Board is going discuss and, hopefully, approve the matrix at our next meeting on 7/22. After that, the Board will be focused on defining Designated Sections for Havana and Ice House (the TC is not owning that as previously expected). The DefCore process is gaining momentum. We’ve reached the point where there are tangible (yet still non-binding) results to review. The Refstack efforts to collect community test results from running clouds is underway: the Core Matrix will be fed into Refstack to validate against the DefCore required capabilities. Now is the time to make adjustments and corrections! In the next few months, we’re going to be locking in more and more of the process as we get ready to make it part of the OpenStack by-laws (see bottom of minutes). If you cannot make these meetings, we still want to hear from you! The most direct way to engage is via the DefCore mailing list but 1×1 email works too! Your input is import to us!